American Cruise Lines' fast-growing fleet of made-in-the-USA small ships highlights the expanding market for domestic river and coastal cruising. American Constellation, the eighth in the company's fleet, and the first of two coastal cruisers, launched in May 2017. (A sister ship, American Constitution, is due out in 2018. Five modern riverboats also are in the pipeline.) The ship is spending its debut season plying the coastal waters of New England before heading west to Washington's Puget Sound and Alaska. ACL engenders fierce passenger loyalty, so it's clearly doing a lot of things right. On our cruise, 31 of the 145 passengers -- 21 percent -- were repeat ACL cruisers. They included a couple that was sailing for the 15th time, and a solo woman on her 12th cruise. Not bad for a line that launched its first ship in 2000. The 175-passenger Constellation's decor lacks flashiness. But who needs glitz when dazzling shoreline is never far from view? Interiors are both attractive in decor and sensible in design. Its six public rooms and 90 staterooms on five decks exude a classic beach-house vibe without going overboard on the nautical themes. Interior spaces are roomy and decorated in soothing, seashore hues of blue, green and coral. Furnishings range from cushioned, white wicker-look chairs and sofas in the fourth-floor Sky Lounge, to more formal groupings comprised of blue and white upholstered sofas and chairs, and blonde wood tables in the larger Chesapeake Lounge on Deck 3. Three intimate lounges offer solitude for those seeking a quiet nook. But other than the evening cocktail hour, public spaces never feel crowded. On the whole, the ambiance echoes that of visiting the seaside retreat of a tasteful friend. Exterior deck space is plentiful in proportion to the size of the ship. Deck 4 has a pleasant covered spot for lounging, eating and drinking. On Deck 5, the aft sun deck is a partially covered area that was rarely occupied on our cruise. The open-air sun deck above it features a putting green and more spots to lounge. On our cruise, the ship had roughly a 3:1 guest-to-crew ratio. But despite the youthful staff's eager attitude and hustle-it work ethic, it lacked polish. Some are students in hospitality programs and were on one-time short-term contracts before returning to school. They'll likely excel at their craft someday, but a lot of them are still learning. ACL is an American line with U.S. itineraries, so it's no surprise that it attracts a predominantly North American clientele. Some had chosen our itinerary (New England) simply because they'd never before been to that part of the country and liked the idea of visiting multiple ports in three states (Massachusetts, Maine and Rhode Island) from a single vessel. Typically, the age range is from 60 and up. A smattering of adult offspring on our cruise were traveling with parents or grandparents. Because all decks are accessible via elevator (except the top sun deck), the Constellation is a good choice for those with mobility issues. 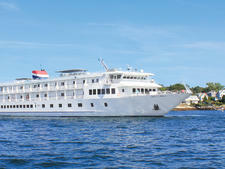 However, only two staterooms are wheelchair accessible. Daytime wear is casual, and comfortable walking shoes are vital for going ashore. It's also wise to have rain gear, a hat and an appropriate-weight jacket on hand. ACL suggests "casual resort attire" for both ship and shore. Though there's no prohibition on shorts and sneakers in the dining room, in the evening most passengers change from their daytime garb to dresses and skirts or dressy slacks for women, and collared shirts and dress pants for men, with the occasional sport coat in the crowd. The basic cruise fare includes onboard gratuities, though tips to shore excursion guides are suggested. Unlimited soft drinks and juices are available in the ship's two main lounges throughout the day. Beer and wine are served with lunch and dinner. There's a nightly pre-dinner cocktail hour with a full bar in both the Chesapeake and Sky lounges. The bar in the Chesapeake Lounge re-opens after dinner for the evening's entertainment. Among premium labels on our cruise were Maker's Mark bourbon and Tanqueray gin. Brews included Sam Adams, Amstel Light and Heineken. The house wine is Coastal Vines in multiple varietals. But if you don't see your beverage of choice on the bar, the eager-to-please staff will make efforts (within reason) to get it onboard for you. Book a suite and you can get soft drinks, juices and bottled water, plus beer and wine, delivered to the stateroom mini-bar. ACL offers some "featured" (no-charge) shore excursions. On our sailing, five of the 16 offerings over the course of the 10-night cruise were gratis. Members of the line's loyalty program, the Eagle Society, get premium shore excursions for free on their fourth sailing. Two washer/dryer pairs on Deck 4 are available for passenger use (detergent included). Free postcards are available from the main desk. They'll even stamp and mail them for you. A limited number of umbrellas are for loan. Wheelchairs, walkers and shower chairs also are available for loan, by pre-arrangement. Wi-Fi is free, but on our cruise, it was extremely sluggish. ACL says it's working to correct the issue. Onboard currency is the U.S. dollar. 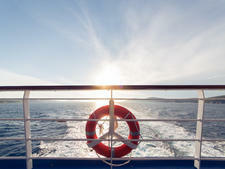 Accounts can be settled by credit card or cash at the end of the cruise. 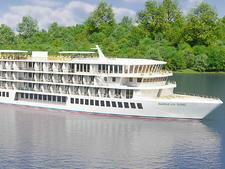 New modern riverboat from American Cruise Lines will cruise the Mississippi River in 2018 before moving west in 2019. 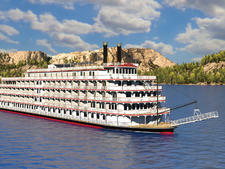 Originally named Queen of the Mississippi, the renamed American Pride paddlewheeler now operates on to the Snake and Columbia rivers on Pacific Northwest itineraries. 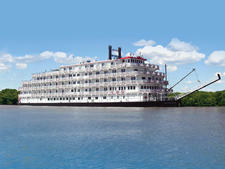 American Cruise Lines has been sailing the Mississippi since 2012. 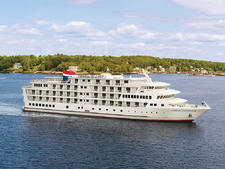 Its newest vessel, the 185-passenger America, is slightly larger than the line's other ships. 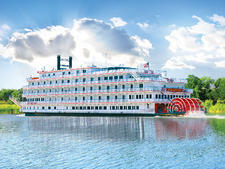 American Cruise Line's paddlewheel riverboat Queen of the Mississippi combines modern amenities with design elements reminiscent of the days when steamboat paddlewheelers plied the Mississippi River. American Cruise Lines introduced the 104-passenger Independence in 2010. Some 75 percent of Independence's cabins have balconies. The ship has seven cabins for solo travelers. Operating exclusively along the U.S. East Coast, crewed entirely by Americans and built on the Chesapeake Bay, American Spirit is an American ship through and through. The 100-passenger American Star is similar to fleetmate American Spirit, though it includes a few more modern touches like flat-screen satellite TVs in all cabins. 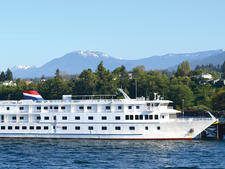 The 120-passenger Queen of the West cruises the Columbia and Snake rivers in the Pacific Northwest. 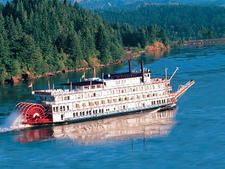 Itineraries include six-, seven- and 14-night sailings from Portland, Oregon. American Cruise Lines newest coastal cruiser boasts spacious cabins and eastern U.S. itineraries that you won't find on other lines. 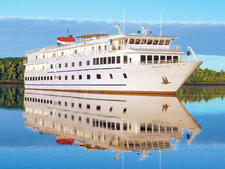 A contemporary river cruise ship with oceangoing pedigree, American Harmony brings big-ship amenities to the mighty Mississippi.